Click Launch Wireless Setup Wizard to begin the Setup Wizard. Click Next to start the Setup Wizard. 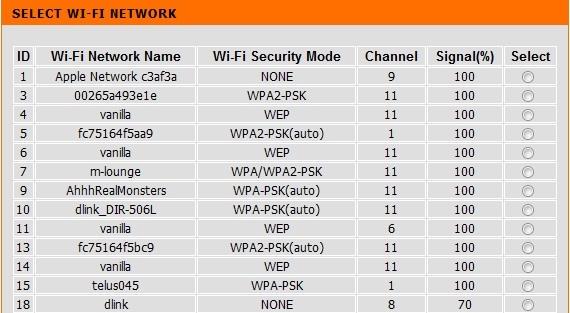 Select WPS as the configuration method only if your wireless device supports Wi-Fi Protected Setup (WPS). Press and hold the WPS button on your wireless router or access point until the light starts blinking green and then release. Please allow up to two minutes for the WPS process to finish. Select Manual as the configuration method to set up your network manually. A list of wireless networks in your area will be listed. Select your wireless network (associated with your wireless router or access point) and click Connect to continue. Enter the Wi-Fi Password for the router you are using to connect and click Next. found in your configuration card. Click Next to continue to finish the setup process. Note: Click the check box to use the same Wi-Fi Network Name (SSID) and the Password for DAP-1320 as your existing network. The setup is now complete. Please click Save to finish. Please wait while the system reboots.